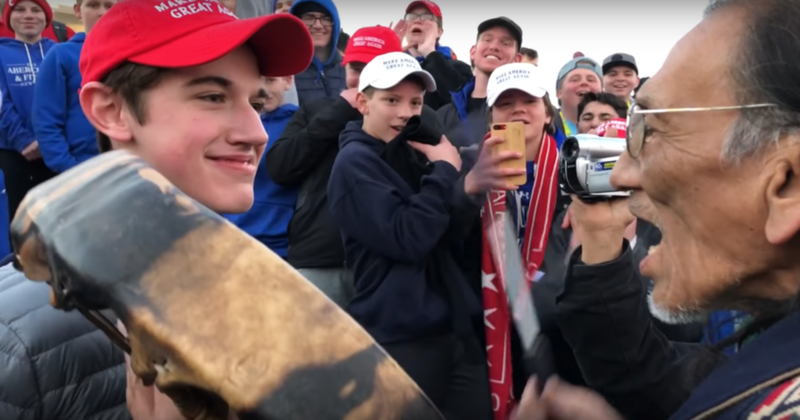 Several media organizations and political pundits rushed to condemn students from Covington Catholic School who allegedly taunted a protester at the Indigenous Peoples March on Saturday, but new video footage casts doubt on the original narrative. The viral clip that made the rounds over the weekend showed Covington junior Nick Sandmann, donning a red MAGA hat, engaged in what appeared to be a standoff with Nathan Phillips, a Native American member of the Omaha tribe. Sandmann was criticized for what looked like a defiant grin, while his peers can be seen jumping and clapping as Phillips chanted and banged on a drum. The students were accused of overt racism, and the backlash was swift. CNN's original tweet said the video showed "a crowd of teenagers wearing ‘Make America Great Again’ hats taunting a Native American elder." New York Times reporter Maggie Haberman questioned if the students would be expelled. National Review published a now-deleted piece asserting that the students "mocked their religion" by mocking Phillips. And Dan Rather said that "the young men trying to intimidate Native American veteran Nathan Phillips rightly outrage." Rather is right — the clip certainly outraged many. But not for the right reasons, it would seem, as the longer video tells a more complicated story. Eliminated from the first round of reporting was the presence of the Black Hebrew Israelites, a religious group known for weaving racist and homophobic insults into their public preaching. And Saturday was no different in that regard, as the additional footage shows the black nationalists yelling slurs at the Covington students and threatening to kill one of the African-American teens. After about an hour, Phillips approaches, and that's when it gets murky. Several students joined in with Phillips' chants, which is undoubtedly problematic if meant in a demeaning fashion. It's difficult to determine their intent, though, and given the context, it's likely they thought he was out to provoke them. That information throws quite a bit of water on the fire that rapidly spread over the weekend as outlets rushed to report the story without all of the facts. But the original slant, condensed to an abridged 3 minutes and 44 seconds, was, well, more interesting. More shocking. More salacious. Bias in media is a powerful business model, one that hinges on appealing to a consumer's raw emotions to ensure that he or she comes back for more. That often manifests as blatant partisanship, where writers and commentators stand to gain from stoking anger at "the other side." A photo, quote, or sound bite without the proper context can prove useful in meeting that bottom line. Outrage sells. Phillips accused the teens of targeting the Hebrew Israelites, telling the Detroit Free Press that "the young men were beastly and these old black individuals was [sic] their prey." The footage appears to contradict those claims. That's not to say the students handled themselves without error, as a few can be seen doing a "tomahawk chop" while Phillips and Sandmann have their staredown. But Sandmann rejects the notion that he was being disrespectful. "I never interacted with this protester," he told CNN. "I did not speak to him. I did not make any hand gestures or other aggressive moves. To be honest, I was startled and confused as to why he had approached me. We had already been yelled at by another group of protesters, and when the second group approached I was worried that a situation was getting out of control where adults were attempting to provoke teenagers." He also disputes that his peers behaved maliciously. "I am mortified that so many people have come to believe something that did not happen — that students from my school were chanting or acting in a racist fashion toward African-Americans or Native Americans," he said. "I did not do that, do not have hateful feelings in my heart, and did not witness any of my classmates doing that." Phillips claims that students started chanting “Build that wall” and screamed, “Go back to the reservation.” If true, that's certainly indefensible, although such remarks are not audible in the videos circulating online. Regardless, both man and teen say they were attempting to defuse what was arguably an awful situation, and with more of the facts in tow, it's plausible that both individuals were well-intentioned. Too bad that's not as interesting as the alternative.